A pioneer in the development of high-tech lecterns, Tecom has launched a new design for its’ TecPodium Interactive Lecterns , to Universities and Colleges. “We’ve now included our latest and fastest technology in the podium and made the design modern, colorful and effective” says Aviv Brosilovski, Tecom CEO. Tecom’s newest and most advanced lectern (TPI-12W) features HD resolution support, a new PC with digital outputs, a wide screen interactive pen display, a higher resolution document camera, stereo sound and a new HD switcher scaler. As a breakthrough audio-visual system for lecture halls, TecPodium Lectern has every multimedia capability built-in, and is managed through one simple control panel. Aviv Brosilovski, Tecom CEO told us “We’ve been successfully installing thousands of TecPodium lecterns worldwide for the last 15 years. As a result we have firsthand knowledge and expertise of both academic and technical requirements for a flawless operation in a presentation environment. Recently, we went into a process of redesigning and re-inventing our leading product. Our customers love the ease of use and the small footprint so we kept both. 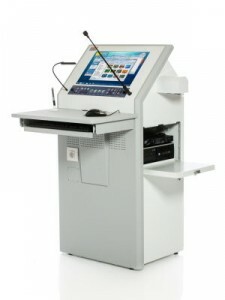 We’ve now included our latest and fastest technology in the podium and made the design modern, colorful and effective”. Tecom Electronics can be found in Hall 1 Stand K4.